As Fool’s Republic opens Simon Wylie is in an institution which is never named but is depicted as some variation on a military prison of the Guantanamo Bay variety. His senses are deprived via the use of an all white environment (clothes, walls, floors, ceiling etc) and constant light. His endless monotony is only interrupted by occasional instances of interrogation or torture. We’re not told why he has been incarcerated and Wylie’s constant request is to know what he is charged with and to be provided legal representation and a trial. We learn, via a non-linear series of flashbacks, about Wylie’s life and, eventually, what led to his incarceration. The premise of this book intrigued me and on reading it did live up to most of that promise, offering a more insightful thriller than average. I was particularly impressed that Dale did not sensationalise the torture aspects of the narrative nor offer unrealistically simplistic solutions to Wylie’s situation or the broader issues being explored. It was all the more powerful for understating these elements and even ignoring the temptation for a flashy, Hollywood-style ending. I must admit though I struggled with the choice of a first person narrative for the story. When an entire tale has to be carried by a single character (we only get the smallest glimpses of people from Wylie’s life) that character has to be something pretty special and, for me anyway, Simon Wylie grew less interesting as the book progressed. He is depicted as a misunderstood genius of the type who can’t (or won’t) fit into the rigid social structures that other people want him to and so ends up in some bad places: reform school, homeless etc. The people he encounters are, according to him, either horrible or in need of his peculiar brand of benevolence (there really didn’t seem to be any middle ground). In the end I don’t know that he was an unreliable narrator though I spent a good 99% of the novel believing him to be one and consequently grew sceptical of his interpretation of the events of his life. I’d like to have read some kind of input (letters perhaps) from other characters directly rather than receiving all the information about their motivations and behaviour via Simon’s somewhat self-serving filter. The fact I didn’t find Simon particularly credible or likeable also meant I had to work a little harder to care about his particular predicament, though I am entirely in agreement with the notion that such institutions and the processes that send people to them are an abhorrent development of contemporary society. But there were times when I’d have cheerfully locked Simon away myself purely for being a whining, ungrateful SOB. That aside though this is a very readable book and it is always refreshing to see important subjects being tackled by fiction (especially those subjects which the mainstream media seems to ignore entirely). 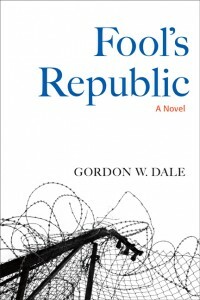 Fool’s Republic provides a plausible and disturbing depiction of what is undoubtedly going on behind closed doors, with the full consent of our governments, to some unknown individual somewhere in the world right now. This entry was posted in book review, Gordon W. Dale, USA. Bookmark the permalink. First-person narrative seems an odd choice for this type of book. If he is sensory-deprived and telling his story himself, then wouldn’t the reader be sensory-deprived as well? Curious. Yet you found the book worth reading. I’ll possibly take a look at it. Bernadette: I enjoyed reading the book earlier this year. It is a more thoughtful form of thriller. While his flaws were irritating I thought they made Wyley a more credible character. The author is an interesting character in himself.